It is true, some things are timeless. Like Blue Plate mayonnaise, banana pudding warm from the oven, Mother Goose, patent leather Mary Janes, Peter Pan collars and lemonade made with real lemons and sugar. There is a reason they are called timeless and classic. Because they stand the test of time. This little dress is by Imperial of Portugal. 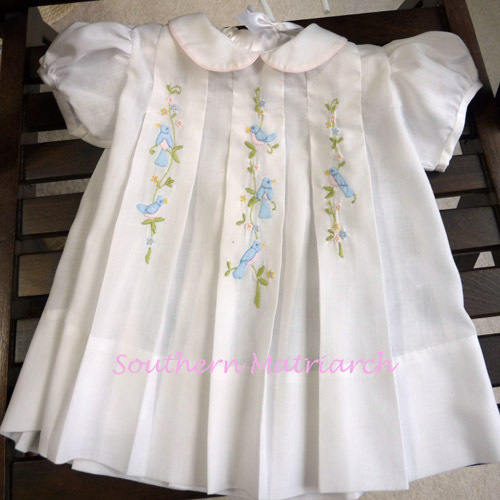 It was baby mommy's first Easter dress. Here it is after having soaked in Biz for several days and a fresh pressing. Pink tucks and lace never go out of style. This dress, baby mommy wore home from the hospital. I hadn't taken up heirloom sewing until this particular child was about 2. I obviously was drawn to it. I bought this classic Cherubs dress for our miracle baby to come home in. Biz is amazing stuff. This had a few baby spit shadows on it. A few days in Biz and fresh as can be. It has been heartwarming to go through the box of baby things to get them ready for this new generation. All of the 30+ year old Feltman Brothers are in the dryer as we speak. What precious dresses!! Won't it be fun to put those on the baby?? I loved seeing Lacey in all her mommy's sweet little things. And yes Biz is a wonder!!! But nobody carries it around here anymore. I have used that stuff for years!! Martha-You are SO right! I have my Feltmans and dresses (and yes, this brand) packed carefully away. You are right about the Biz. I recently threw my 33 yr. old (and never sealed) wedding dress in a bathtub with Biz. Guess what? Good as new! 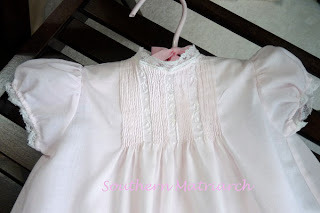 Of course, now that it is clean I still have no idea what to do with it :) I was thinking one day a christening gown made with those precious tucks and lace! Take care of these treasures! Such precious memories and sweet dresses. Love timeless things! Lovely little timeless, classic dresses. Never heard of Biz, Blue Plate Mayonnaise nor warm banana pudding, although the latter does sound rather yummy! I just love your blog...sadly, I think I am addicted to it. Can't wait to see the coming home ensemble! 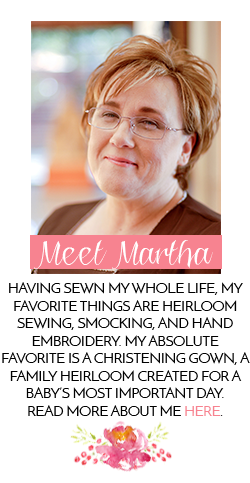 Oh, Martha, these little classics are just precious. I exclaimed out loud when I saw the blue birds embroidery and my husband and daughter had to see what all the fuss was about. BOTH said that the dresses are beautiful and BOTH really like the blue birds. 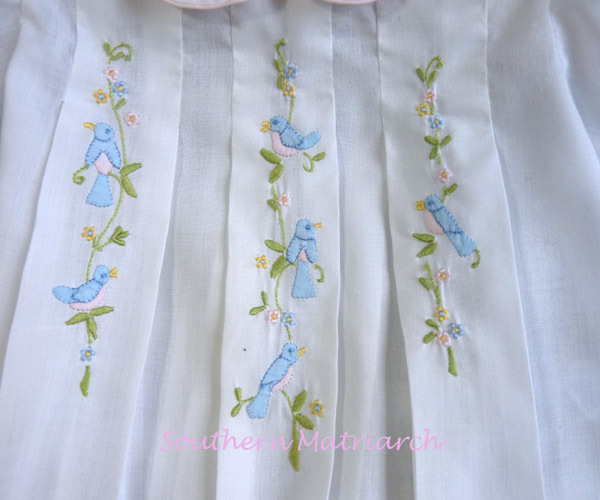 After years of exposure to my sewing, even my husband is drawn to classic and beautiful baby things and can even discuss smocking (a bit). :) My daughter expects to have a closet full of things waiting for her babies someday (yipee!) I can't wait to see these on your new grandbaby! 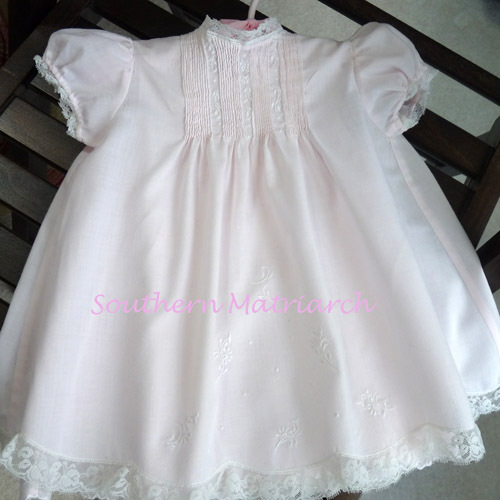 BTW, I have imported handmade baby dresses that were MINE. My godmother had them and gave them to me years ago. My sweetie wore them, too! Your two dresses are just so classic and pretty. What fun to get all the pretties out of the box, Bizzed, and ready for the next generation!